"Silly rabbit Trix are for kids" That is what I am hearing everyday in my house. I think that is what he thinks the name of the cereal is. 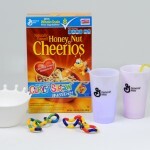 We received a great General Mills sample package thanks to My Blog Spark. Cereal isn't something I normally carry in the house, or if I do there is only one type. Genreal Mills has a great selection of Big G cearals. My son, Cooper, is four and this is the first time he has had Trix. We typically have a box of Cherrios in the cupboard but again we aren't a huge cereal family. If we do have it, I like to eat it at night. Weird I know. If you haven't seen the commercials Trix now has come out with the funky color swirls. So instead of getting just a ball of orange, you might get some purple or green with it. They take great too. I remember eating Trix and Lucky Charms as a kid. With this cool sample back came this awesome silicone bowl. It looks like split milk. It has a big splash on the side of it but it'a great for kids. We use it in the car because I know he won't break it. We also received 2 glow glasses, 2 tangle toys, and curvy straws. Cooper loves twisting the toys into shapes and then using them with his toy men as lassos. Gotta love boys! I myself love the glasses. They are a nice heavy plastic and hold up well in the dishwasher. They will be great this summer outside or to take on a picnic. I enered a couple of other giveaways from your site. I found it through Mimi Loves All 8 Blog. i don't know how i originally found your site. i found this particular giveaway while surfing around here….. I found out about this giveaway from your newsletter. Found about this giveaway through your e-mail link! I am signed up for your newsletter so I found out about the giveaway that way. I read it on your newsletter. I found out about this giveaway through your daily email.